CHAPEL HILL, N.C.– Local residents from the Currituck mainland and the northern Outer Banks—along with hunters, fishermen, and wildlife enthusiasts from the North Carolina Wildlife Federation—reacted with dismay when the North Carolina Department of Transportation (NCDOT) announced late Friday that it had signed a legal approval for the $500 million Mid-Currituck Bridge. The Southern Environmental Law Center represents the groups and has written multiple letters over the years calling into question the need for the bridge and the adequacy of the agencies’ environmental review for the project. 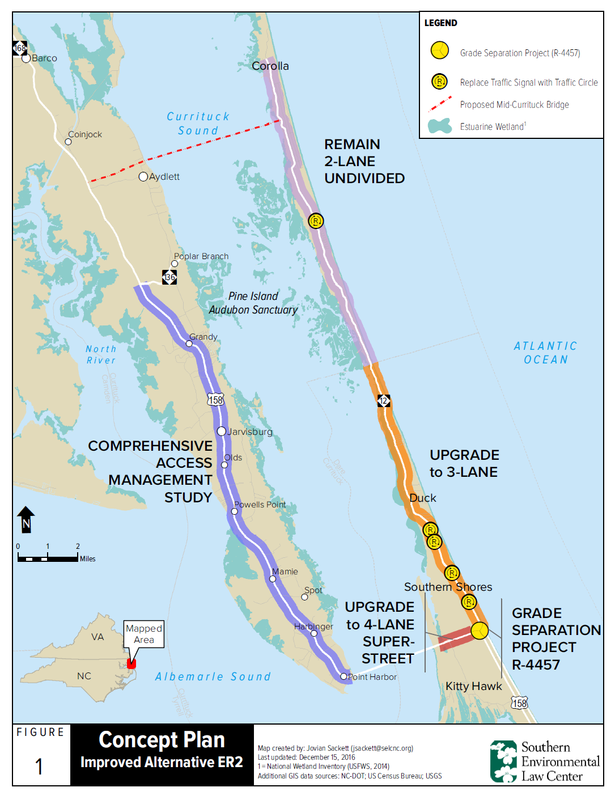 The $500 million proposed bridge would stretch from Aydlett on the Currituck mainland across the environmentally-sensitive Currituck Sound to Corolla on the Outer Banks. The bridge would lead to growth in undisturbed areas along the Northern Outer Banks, along with increased pollution, thus harming important wildlife habitat in the area. The highly controversial bridge has failed to gain necessary legal approvals to move forward for the past 40 years. It would cause significant damage to the Currituck Sound, and its pricey tolls—by some estimates up to $50 during peak summer months—render the project only usable by wealthy tourists. Despite receiving this approval from the Federal Highway Administration, NCDOT has been unable to present a viable financial plan to pay for the bridge. The new document shows that NCDOT predicts a drop in long-term traffic expectations, calling into question the agency’s claimed need for the bridge. Less traffic would also mean less toll revenue going toward the cost of the bridge. As a result, the bridge may consume all state transportation funding for North Carolina’s Northern coastal region for years to come. The groups are particularly concerned with the lack of transparency surrounding the approval process. There has been no public analysis of the bridge and no opportunity for the public to weigh in on options since 2012. Despite the significant changes and new information that has come to light in the intervening years, NCDOT has chosen to avoid a public process and engage in closed door decision-making instead. Among the new information NCDOT has ignored is a study, presented by the groups last year, looking at a suite of less costly alternative transportation solutions for the Northern Outer Banks. The proposal includes minimal road widening along key congested stretches of NC 12, a redesigned interchange between NC 12 and 158, and the conversion of signalized intersections to roundabouts, as well as programs designed to reduce transportation demand, such as incentives for staggered check-out days at vacation rental homes, and an “electronic key” program that would eliminate unnecessary trips to centralized vacation rental offices. The alternative solution was designed to ease peak congestion days, which occur primarily on summer weekends, at drastically less cost to taxpayers and the environment than the proposed bridge. The approach also could be implemented much sooner than the proposed bridge. The Southern Environmental Law Center is currently reviewing the NCDOT’s approval documents and coordinating with its clients about next steps. 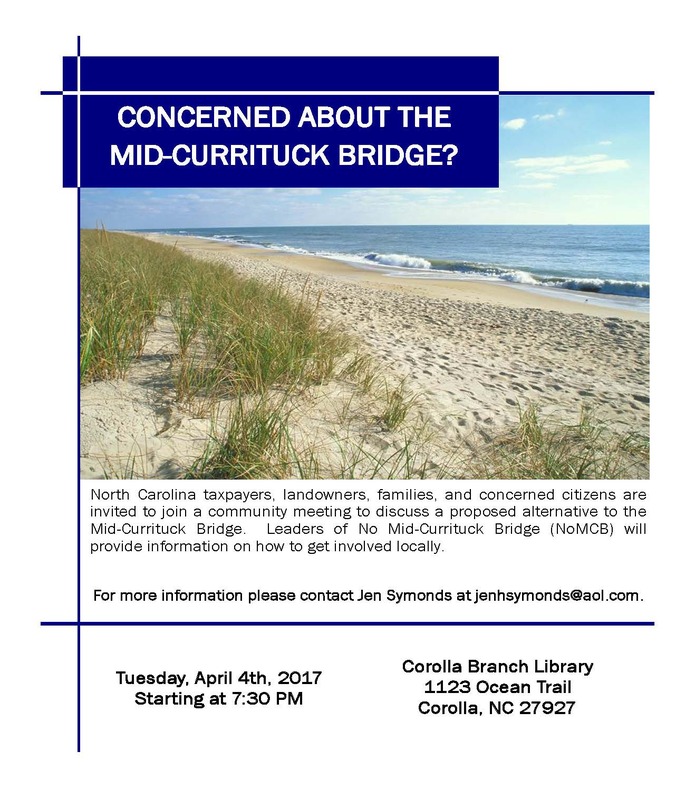 No Mid-Currituck Bridge is comprised of residents of and visitors to the Currituck mainland and Outer Banks who oppose the Mid-Currituck Bridge. NoMCB strives to protect the unique natural environment of the Currituck mainland and the Outer Banks that hundreds of thousands of visitors come to experience and enjoy every year. North Carolina Wildlife Federation is a 501 © 3 nonprofit organization dedicated to the protection, conservation, and restoration of North Carolina wildlife and habitat since 1945. An attorney for the environmental group opposing construction of the proposed Mid-Currituck Bridge said a lawsuit is an option to block it. “It’s definitely not off the table,” Kym Hunter, an attorney in the Chapel Hill office of the Charlottesville, Va.-based Southern Environmental Law Center, said recently. Local officials apparently think so too. During a recent meeting of the Currituck Chamber of Commerce’s Governmental Affairs Committee, Chamber President Josh Bass said he believes the Southern Environmental Law Center will file suit to stop the bridge project. Allen Moran, new N.C. Department of Transportation Division 1 board member, was asked about Bass’ assertion. He, too, thinks the SELC lawsuit on the bridge project is likely. “If not to stop it, to maybe change it, yes,” Moran said. 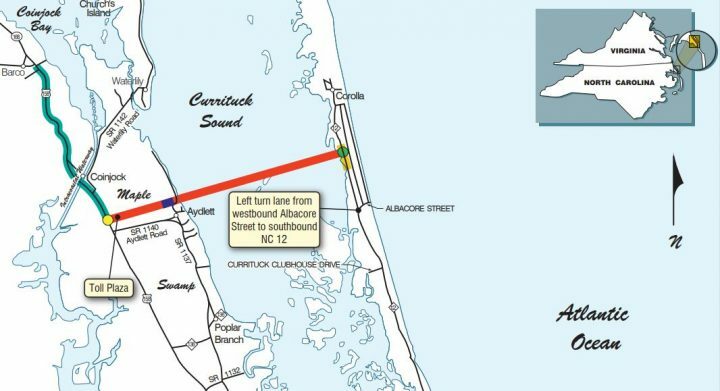 The N.C. Department of Transportation’s statewide master plan calls for a proposed seven-mile, tolled crossing over the Currituck Sound between Aydlett and Corolla. NCDOT has estimated the cost of the project at $489 million and anticipates releasing a record of decision on the project by next April. The record of decision is generally considered the final step in the process of preparing an environmental impact statement for a road project. Hunter said any decision about whether there will be lawsuit on the bridge project will depend on whether NCDOT complies with the law. Asked what laws specifically NCDOT needs to follow, Hunter said they include the National Environmental Policy Act, the Clean Water Act, and the Coastal Management Act. Hunter said her organization has encouraged the NCDOT to take a second look at non-bridge alternatives, particularly since so much has changed the past five years when a previous environmental document on the bridge project was prepared. She said those changes include increased costs and changing traffic forecasts. For example, the SELC believes the Mid-Currituck Bridge will now cost as much as $600 million, not the $489 million NCDOT has projected. Hunter said the SELC’s estimate is based on its review of an NCDOT draft document and leads it to conclude the bridge shouldn’t be built. “We don’t believe the bridge is necessary or affordable,” she said. Hunter said she also believes NCDOT needs to prepare a supplemental environmental document on the bridge project and put its text out for public comment. She was referring to a 61-page document the Southern Environmental Law Center mailed to NCDOT in December. Hunter said the SELC, supported by residents opposed to the bridge, would still like NCDOT to consider non-bridge alternatives like improving the intersection of U.S. Highway 158 and N.C. Highway 12 in Dare County. The SELC and residents opposed to the bridge also would like to see minimal widening of N.C. 12 northward from U.S. 158 and conversion of intersections with traffic signals to roundabouts. They also would like to see more incentives offered so that vacationers could check out of their rental cottages at more staggered times. They’d also like to see an “electronic key” program to eliminate vacationers’ unnecessary trips to rental offices. The SELC believes both would help reduce the volume of traffic on N.C. 158 and 12 that is spurring demand for the bridge. “We think if there could be some incentives to help move that along a little faster, that could be a lot more cost-effective and better for everyone,” Hunter said. She said the SELC has had conversations with NCDOT but seen no indications the agency plans to put out a new study for public review. The agency also has not signaled it plans to address the SELC’s concerns, she said. Tim Hass, a spokesman for NCDOT, said a project team continues to review comments and other materials provided by the SELC about the bridge project. The study team is also reevaluating and updating previous studies of the project, he said. He said the project originated from a request from local officials, who submitted the project for consideration as part of North Carolina’s process of scoring and ranking transportation projects to determine which ones receive funding. “The Mid-Currituck Bridge is the top transportation priority for the local communities and is being developed by the department accordingly,” he said. CHAPEL HILL, N.C.– Local residents and property owners from the Currituck mainland and the northern Outer Banks sent a letter today to Secretary of Transportation, Jim Trogdon, asking him to look at a more affordable and less damaging solution to traffic congestion in the Northern Outer Banks than the proposed $678 million Mid-Currituck Bridge . No Mid-Currituck Bridge, a group comprised of local residents and visitors, asked Secretary Trogdon to study a suite of alternative solutions submitted by the group that includes minimal road widening along key congested stretches of NC 12, a redesigned interchange between NC 12 and 158, and the conversion of signalized intersections to roundabouts. The $678 million proposed bridge would cross the sensitive Currituck Sound between mainland Currituck County and Corolla on the Outer Banks. Residents of those areas and visitors who wrestle with beach traffic, provided consultation and suggestions for the alternative solution developed under the guidance of an experienced transportation expert. The proposal also includes programs designed to reduce transportation demand, such as incentives for staggered check-out days at vacation rental homes, and an “electronic key” program that would eliminate unnecessary trips to centralized vacation rental offices. The alternative solution was designed to ease peak congestion days, which occur primarily on summer weekends, at drastically less cost to taxpayers and the environment than the proposed bridge. This approach also could be implemented much sooner than the proposed bridge. By contrast, the North Carolina Department of Transportation has been unable to present a viable financial plan to pay for its proposed $678 million bridge. Last fall, NCDOT’s own analysis showed a drop in long-term traffic expectations. Less traffic would mean less toll revenue, which the state is relying on as a primary means of financing the pricey project. One potential area of expansion for the North Carolina ferry system would be to connect Inner Banks communities with those on the Outer Banks, a state official says. Chuck Hefren, of the General Assembly’s Program Evaluation Division, believes expanding the ferry system beyond the seven routes now in operation on the state’s Outer Banks could be accomplished through a public-private partnership. Hefren, who addressed local officials during a meeting Friday in Edenton, said it could be worthwhile to use passenger ferries, for example, to increase access to locations such as Edenton. More visitors could lead to increased revenue for both the state and local governments, Hefren said. The Edenton waterfront is ready to receive ferry traffic if a ferry route were established to the town, he said. Building the additional ferry vessels in North Carolina would also be great for the state, Hefren said, echoing comments by two boat-builders who attended Friday’s meeting. Currently the state operates 22 ferry vessels. Hefren also said if the private sector were to operate ferries on the sounds of the state, state officials could require that those ferry vessels used be built in North Carolina. Joseph McClees, a lobbyist representing a number of counties in the region, said the ferries are a well-kept secret and need to be promoted better by the state. “It’s an asset,” McClees said of the ferry system. The ferries are also a potential tourist destination, McClees said. People could come to the state to ride the ferries if they were better-publicized, he said. McClees also believes tourists could come to the Inner Banks region and then use ferries to visit the Outer Banks. Susan Beckwith of the Inner Banks Inn said water taxis such as those used in Baltimore’s Inner Harbor could also be used to benefit the Inner Banks region. Michael Reardon, a boat builder who attended Friday’s meeting, also mentioned the possibility of adding a couple of ocean-class ferries to the system to run, say, from Cape May, New Jersy to Nags Head. That could operated as a public-private partnership, he said. Wit Tuttle of Visit NC urged Hefren to consider the various roles ferries play in different locations, from serving tourists to helping commuters get to work. “Each ferry route is kind of a different beast,” Tuttle said. He pointed out that some ferries carry mostly local residents while others serve large numbers of visitors. In certain locations there are no alternatives to the ferry, he added. Hefren said the state needs to consider return on investment. From that standpoint it could be possible to justify more spending on ferry infrastructure, he said. Hefren said that if the revenue generated by an increase in visitors turned out to be more than would be raised by an increase in ferry fares, then that can be part of the report he presents to the General Assembly. Hefren also mentioned the possibility of using the marine transportation system to relieve some of the traffic congestion to the Northern Outer Banks. He also put forward the idea of using ferries as a way to help workers on the Outer Banks’ hospitality industry get to their jobs from their homes in Inner Banks communities. After the main meeting Friday a smaller contingent remained to hear a presentation on a study by Nicholas Didow, a professor at the Kenan-Flagler Business School at the University of North Carolina at Chapel Hill, proposing that a privately funded passenger ferry on the Albemarle Sound could be profitable. The study projects an annual ridership beginning the first year of 107,000, a $13.8 million capital expenditure upfront and annual operating expenses of $1.95 million. The ferry has the potential to be profitable in the first year, according to the study. An estimated 94 jobs would be created and the study estimates the tourism impact at $14 million.